One of the main issues I have with labels is the group children with a huge array of skills, interests, talents together and that leads to approaches to their education that try to suggest it will work with anyone who has that label. I have used the TEACCH approach widely but never with the whole group and even if two students use it the way they use it is very different. I work with children all of whom have a diagnosis of Autism & associated communication difficulties. As a school we aim to support them to manage the frustration that leads to sometimes behaviour that challenges us as adults to support them through their distress. In this role both the children and myself as the class teacher, are supported by a team of experienced and very capable learning support assistants. As anyone who has worked with children who have a diagnosis of Autism knows there is no one size fits all answer to their educational needs. I have a range of classes from 4 to 7 children who each demand a completely individualised approach to enable them to succeed in a classroom environment.I must stress I never seek to fit the child into my class but adapt the environment as much as possible to reduce stress for that young person. This means no two resources or even lesson plans will be totally suitable for each individual. Each learner demands a bespoke approach to their education. For some the fact they are in a classroom with other children is an achievement that we struggle to comprehend. That often they will smile, laugh, seek interaction, and affection defies the stereotypes I was briefly told about on my initial teacher training. In my NQT year I attended the 3 day TEACCH course. This covered the TEACCH approach, research and values with both the theoretical and practical examples of the highly structured teach method. The part I was most interested in was how to implement a highly structured visual approach for individuals & groups. Now as all teachers know you cannot take an approach that works in one school and shoehorn it in to another setting, everything could and should be personalised within the framework. Since that course I have implemented this approach in all my classrooms to a greater or lesser degree. some learners benefit from the whole approach, rigid structure and detailed visual timetables. For some this becomes too restrictive and can lead to anxiety if a favoured or disliked activity is introduced at the wrong time or a staff change is required at short notice. The most effective strategy I have embedded from the TEACCH approach is that of worktasks. These are self contained and, as much as possible self explanatory activities for the child to complete. Usually this is for a reward – however this could be another whole blog post in itself. These can be put in a “start” tray or drawer and be placed in a “finished” tray or box as completed. The key principle is that the child should know exactly what is expected of them. Do not ever place a new task in the tray as they are working, its not fair and breaks trust. I usually give two or three tasks with an expected time of 10-15 minutes following a bit of teacher led or group work to form the core of the lesson. These tasks can be done in pairs or at a group table but they are usually completed at an individual workstation. This is of vital importance in a special school where the social aspect of education is as (if not more?) important than the academic part. I have made, tweaked and borrowed ideas for hundreds of different teaching resources over the years. there are many resources available online Pinterest is particularly useful. 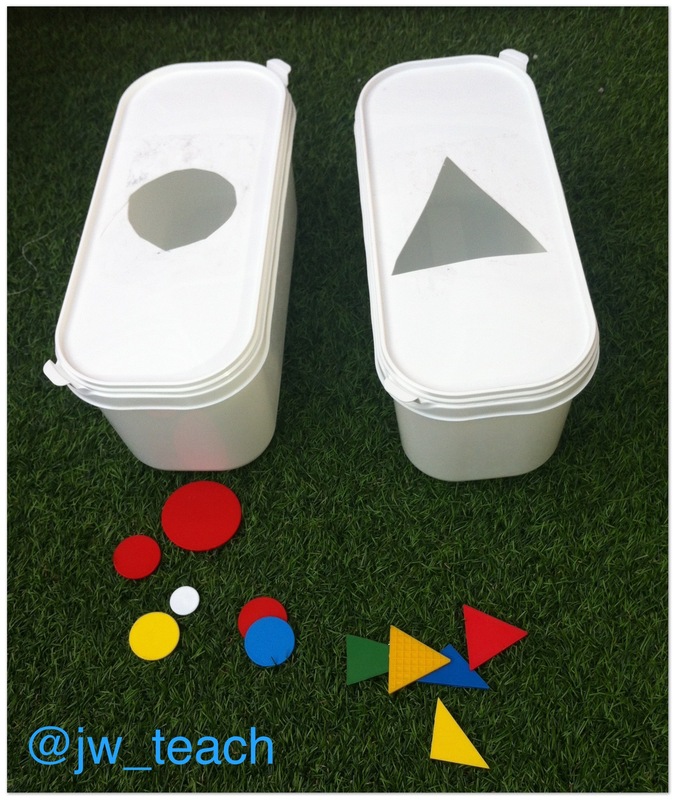 A simple shape sorting tub made from scavenged Ice cream tubs and shapes from the resources cupboard. This is very basic and because mistakes can be made but should not be the a cause of frustration you can assess the end result (are all the shapes right etc) You could adapt to be more structured by having holes that only accept the correct shape. 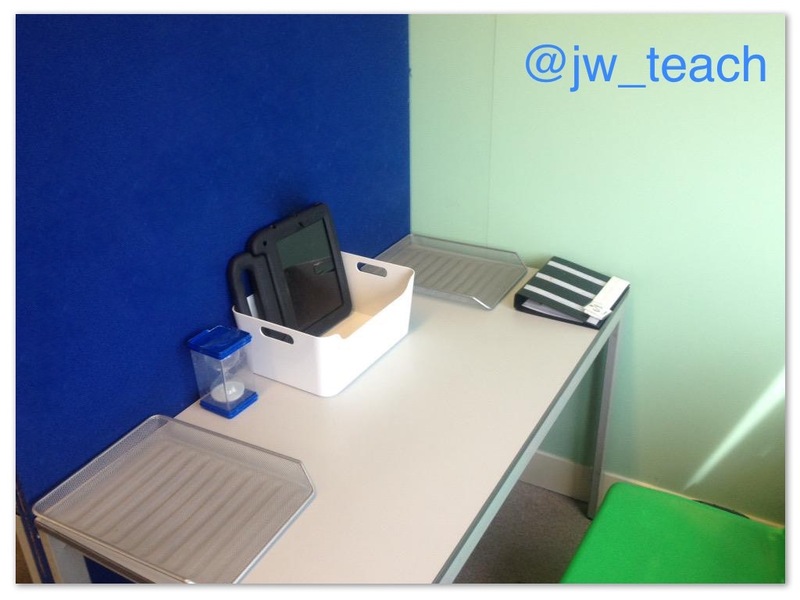 It is very plain with no instructions, If needed a prompt sheet or teacher instruction can be used, you could even film a solution or peer completing the activity to be viewed on the ipad or IWB. You should also carefully plan the level of challenge the task will present to the learner. You could build this over time, or with careful consideration of the individual’s needs create challenges for them to overcome – such as having to request a missing piece using their PECS book. These are some of my favourites, self contained and easy to store in old DVD cases, VHS are even better as you have more room. 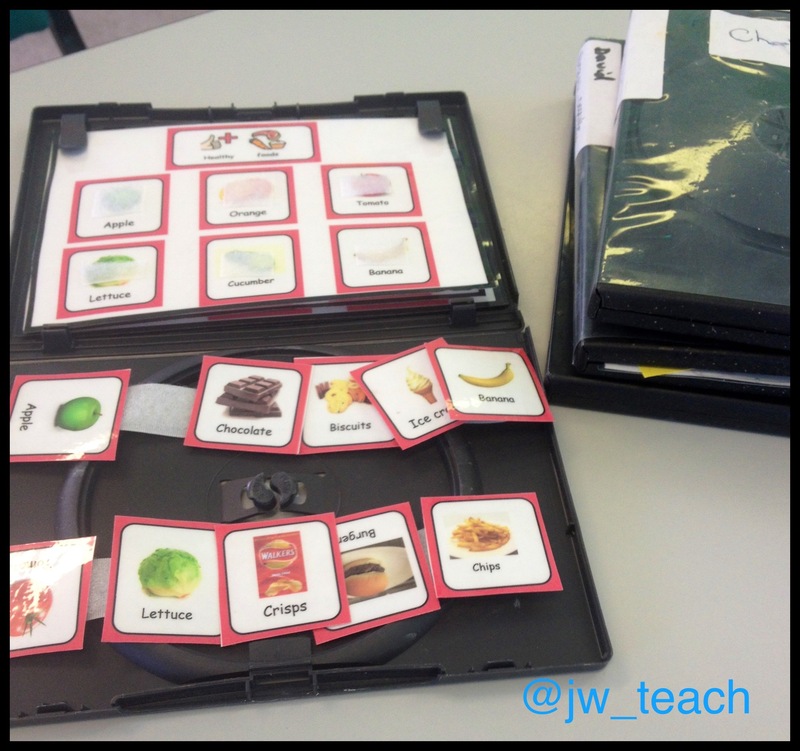 This is a simple matching healthy and unhealthy foods using the same symbols and the children’s PECS books. All resources are stored inside the case. The child just has to open it and take out the laminated velcroed sheets. 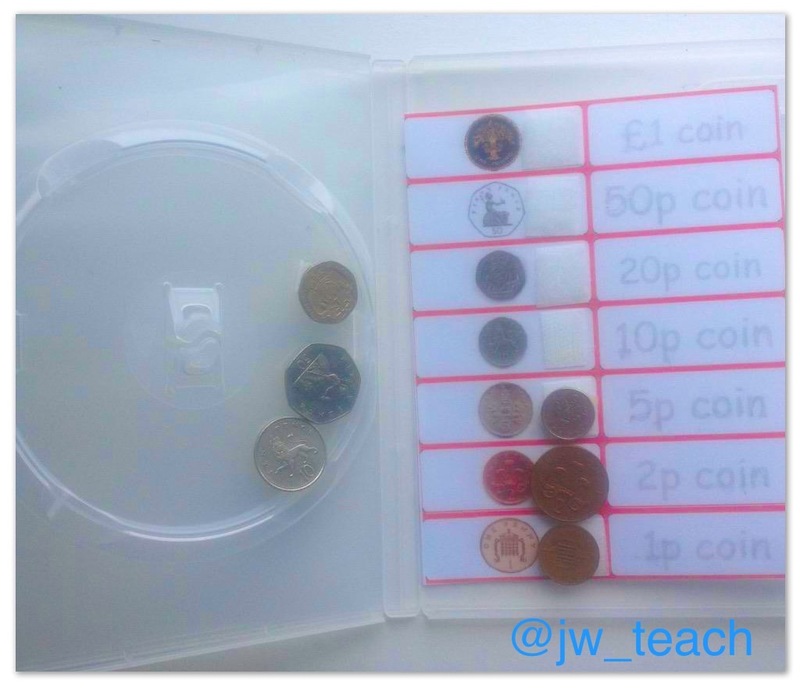 You can differentiate by removing words or symbols etc using a dotted font to overwrite or adding incorrect coins. Similar idea but with coin identification. The coins are attached with Velcro to the inside of the DVD case and matched to the sheet on the other side. The child can then overwrite the names. Real coins are best to use here. And of course you can adapt the task as the child develops their skills by just replacing the sheet with a more challenging one. Finally just a picture of a workstation in my classroom. The blue board can be used to mount visual schedules but is mainly to reduce sensory distractions such as light or movement of others. The silver trays are start on the left and finished on the right. The iPad is the motivator, it may not be appropriate to have on the desk but I find it gives the child control and shows trust. I hope you have found these ideas useful. Previous Excellent SEN Blogs to follow: Part 1. Next Excellent SEN Blogs to follow: Part 2.